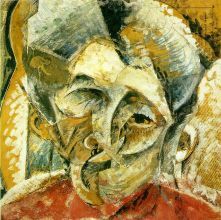 Umberto Boccioni (October 19, 1882–August 16, 1916) was an Italian painter and sculptor and a member of the Futurist movement. 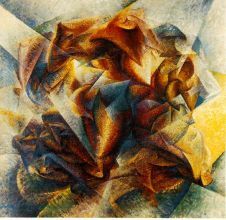 Like other Futurists, his work centered on the portrayal of movement (dynamism), speed, and technology. He was born in Reggio Calabria, Italy. 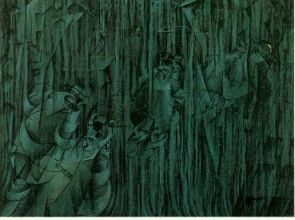 Umberto Boccioni studied art through the Scuola Libera del Nudo at the Accademia di Belle Arti in Rome, beginning in 1901. He also studied design with a sign painter in Rome. 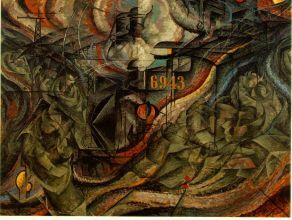 Together with his friend Gino Severini, he became student of Giacomo Balla, a divisionist painter. 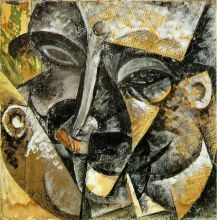 In 1906, Boccioni studied Impressionist and Post-Impressionist styles in Paris. During later 1906 and early 1907, he shortly took drawing classes at the Accademia di Belle Arti in Venice. 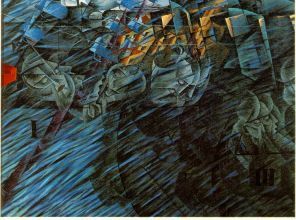 In 1901, Boccioni first visited the Famiglia Artistica, a society for artists in Milan. After moving there in 1907, he became acquainted with fellow Futurists including the famous poet Filippo Tommaso Marinetti. The two would later join with others in writing manifestos on futurism. In 1914, he published Pittura e scultura futuriste (dinamismo plastico) explaining the esthetics of the group: “ While the impressionists make a table to give one particular moment and subordinate the life of the table to its resemblance to this moment, we synthesize every moment (time, place, form, color-tone) and thus build the table. ” He exhibited in London, together with the group, in 1912 (Sackville Gallery) and 1914 (Doré Gallery): the two exhibitions made a deep impression on the young English artists: some joined then the Vorticism, lead by Wyndham Lewis.